Side profile of Dr. Kellersberger's album before treatment. In 2013, the Presbyterian Historical Society launched an Adopt-a-Document campaign to conserve the largest and most complex historical object it has ever restored: a 300-page, 5-inch-thick photograph album and scrapbook created by the trailblazing leprosy physician, Dr. Eugene Roland Kellersberger. Kellersberger was a Presbyterian Church in the United States medical missionary to the Congo from 1916 to 1940. During that time he documented his experiences treating leprosy and living in the Congo through photographs, notes, and sketches, all of which he kept in this oversized album. Prior to its treatment, the album’s spine was severely deteriorated—it was impossible to open without breaking the brittle pages, making its contents inaccessible. Conservators at the Conservation Center for Art and Historic Artifacts disbound the album, mended and reattached its photos, and placed each page inside a protective polyester enclosure. Side profile of Dr. Kellersberger's album before and after treatment. Now, each page can be handled and viewed without fear of damage, and the images can be safely digitized. Below, staff members take the first look at images previously impossible to view. 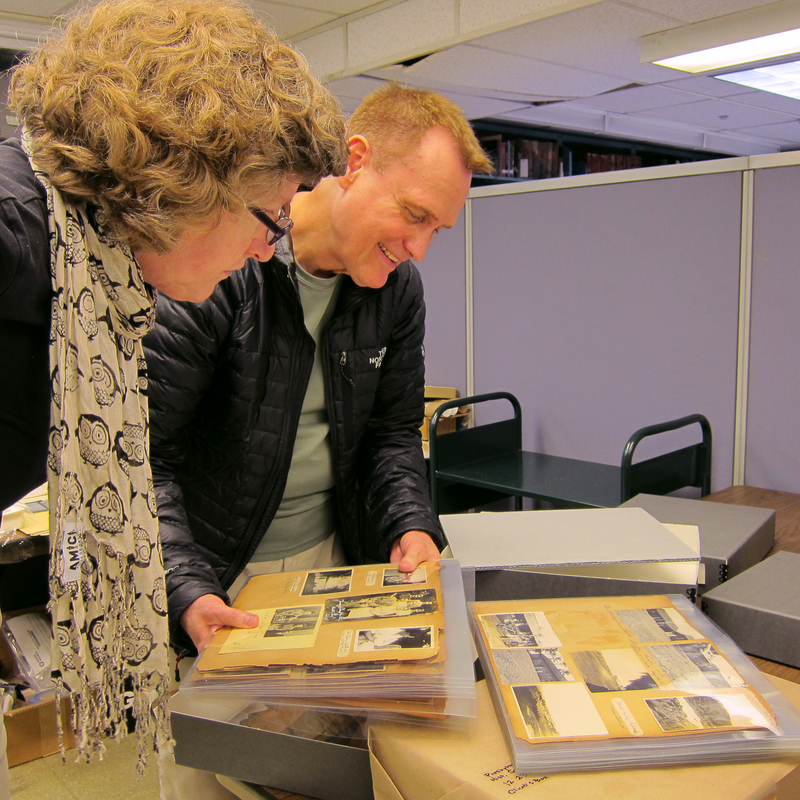 Bill Brock and Jenny Barr marvel at the restored album. Because of our supporters, we were able to raise the funds required to conserve this unique artifact and make it accessible to researchers and scholars. Thank you for your support, donations, and interest in last year’s Adopt-a-Document project! News about our 2014 Adopt-a-Document project will be coming soon.